Finally got this after a year. Can’t buy too many games at release when you’re a poorfag. Bought the PS3 Japanese version since I don’t have a PS4. From what I’ve seen, the English translation of the PS4 SEA version is very bad grammatically speaking, but they managed to get most plot information correctly and there’s no misinterpretation. Thanks to this if there’s something I don’t understand while playing the game in Japanese I’ll check people’s videos of the English version. I heard some months ago they patched the game, translating the summaries of the past OG games too. I hope they did a good job. 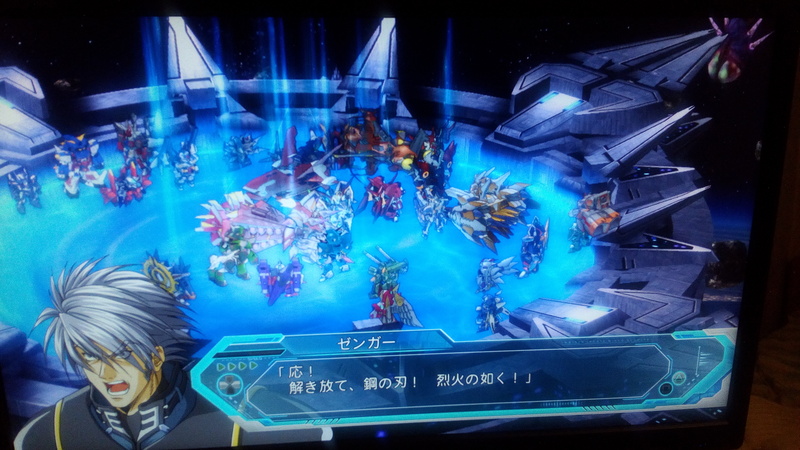 That way it’ll contribute to having better accurate info of SRW OG story in English. Feels weird I’ll finally get to see how Raftclanz looks like in 3d animation.Well, unless I die before playing the stage where EKUSUTORAKUTA, MAKISHIMAMU! happens. Though if I die and manage to go to paradise I’ll see it anyway. Waited so long for this. I purposely didn’t watch most of the new units appearing in OGMD’s animations on Youtube so I can discover while playing. 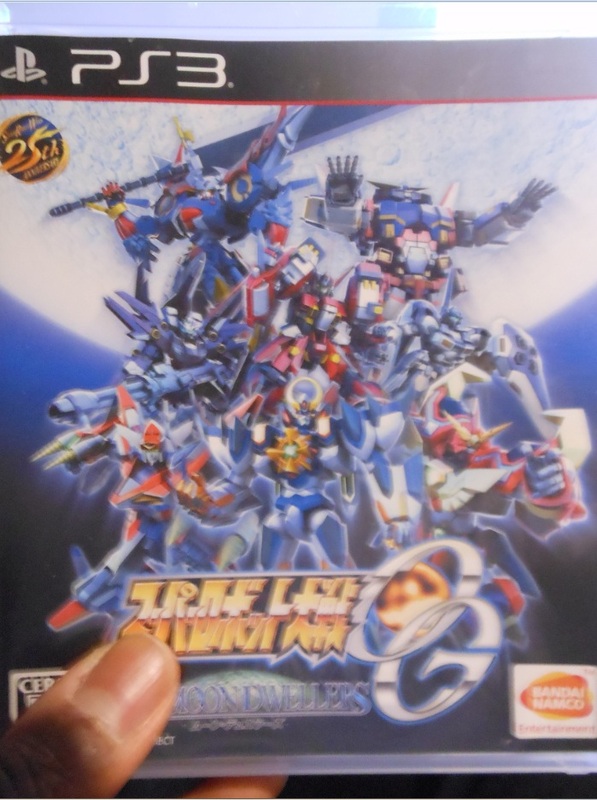 It’s also the first time a SRW game I already played and finished is getting into OG. I played 4 and Alpha 1 on Alpha 1 on Dreamcast but didn’t finish them before playing OG1 on GBA. SRW J got a special place in my game related memories since it’s what also made me discover a show that joined my list of favorites shows ever: Tekkaman Blade. (though technically I played W before, and saw it first in W, not J). This entry was posted in Games, Opinions on..., Super Robot Wars and tagged OGMD, SRW, Suparobo on August 2, 2017 by rockmanshii. I’m looking forward to the game though I don’t have a ps4 or vita. 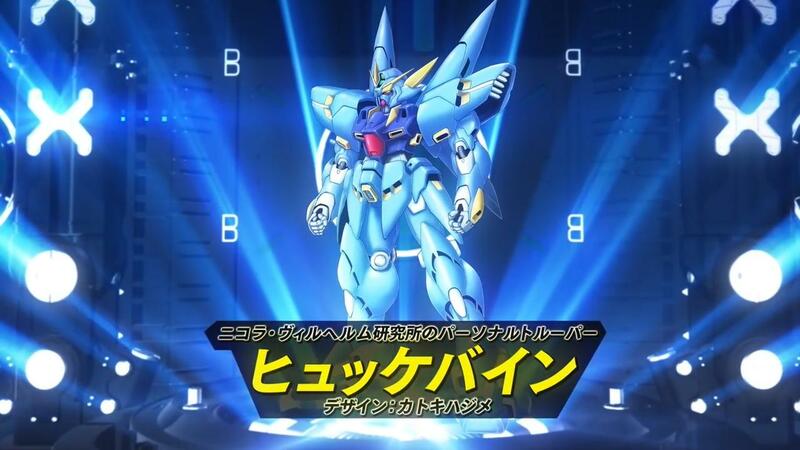 I still remember how disappointed when they initially revealed it with the castlist having half stuff already in Z3 but then PV1 had Huckebein and Grungust and Mazin Emperor G and other cool things and then they showed they’re putting in tons of new ideas and systems to try and make the games better. Looking forward to how it’ll turn out.I hope they’re good ideas. At least series that were already in Z3 are getting what they should have got in Z3, like Athrun and Lunamaria actually being playable or Fowler being in this time. Shiki Doji said he’s the one who drew the portrait for Fowler. He probably did new ones for the other characters that don’t have an anime design yet compared to the ones he already did for Z3 too. Seems the FMP units attack animations are still utlra weird and stiff but a bit better. Fowler is in so this means you’ll probably actually fight Leonard’s team unlike in Z3. There will probably be a stage with Leonard+Fowler+Sabina+Casper. Crousseau is my favorite character in FMP so I’m looking forward to his art battle with Fowler. Maybe there will be a way to make Leonard stop being crazy and join too. I’m also really interested in the scenario too. Similar to how Z used Orguss as the base of everything, seems they’re using Yamato as the base of everything along with a bit of Gundam, which isn’t surprising considering the amount of gundam series in the cast. I wonder if Kaworu will be the same one from Z3. Looking forward to how the Cross Ange plot will play out too. Looking forward Ersha and Vivian being cool and Rosalie doing dumb stuff. And looking forward to the double Voltekka combo attack between Ange and Salamandisney. I have a dream of a SRW with tons of series I like including Pretty Rhythm and Cross Ange, and with people thinking Hijiri is automatically evil because all the blond men with his voice are. And Ange bullying him or something and ending in a fight with Juné protecting him. This entry was posted in Opinions on..., Super Robot Wars on January 17, 2017 by rockmanshii. Obari tweeted he’s happy Huckebeins got resurrected. When they first announced the game I was very disappointed about the cast list, a lot of stuff was in Z3 already and they’ll definitely recycle animations so it feels really redundant. But the cast list turns out to be the only disappointing thing now. I’m really hyped about the game now. I don’t have a ps4 nor a vita though. Protagonist 1: Murakumo Souji, seiyuu is Kirimoto Takuya. His seiyuu’s first involvement in SRW was a SRWOG drama CD more than 10 years ago, voicing dr Robert (Rob). Then he voiced him in the anime. When voicing stufff Okaiyu was having fun voicing and Kirimoto used to be like “one day I want to voice a pilot too, this looks so fun…” Then in Masoukishin he voices “chika aidoru” aka Gido aka notCraig Daniel James Bond. Protagonist 2: Kisaragi chitose, seiyuu is Kanda Akemi. 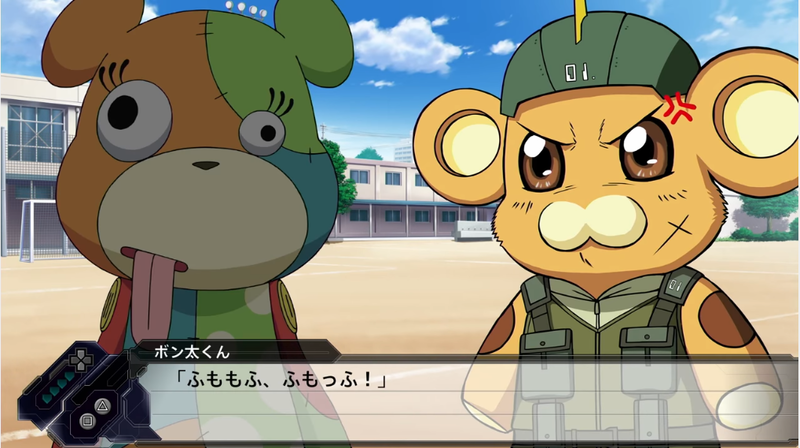 She’s really happy to be voicing a main character in SRW. Both chars designed by Watanabe Wataru, Masoukishin F& Cross Omega’s chara designer. His designs are really good especially the guys. I really hope more Masoukishin characters get in OG now that the series is over. Especially the characters he designed for F like Circuit kun, Elisha and Lionel. I definitely think Circuit will get in one day as he was considered the main character of the game until Masaki gets rescued and got to be put on the same level as Masaki Shu Eran. Like with Chitose here, sometimes Watanabe Wataru make the girls’ outfit too much sexual fanservice oriented. Her outfit is one thing, since there’s already tons of SRW OG characters with revealing outfits, but that outfit PLUS that pose makes it seems they’re trying way too hard to pander. Why couldn’t he have just drawn her standing up normally. At least they’re self aware of it and Kirimoto was joking about it and taking her pose. OG mecha design by Linebarell co-mangaka Shimizu Eiichi, 1st time he does a OG for a SRW if I heard correctly. Then there’s the Grungust pilot and the Huckebein pilot that wear the same pilot outfits as the OG characters in 4/F/F Final, which is a great fanservice move. This makes me really hyped. I really like these pilots suits. They’re both designed by 糸井美帆/Itoi Miho who already did lotof previous OG characters designs like the SRW D or J characters. 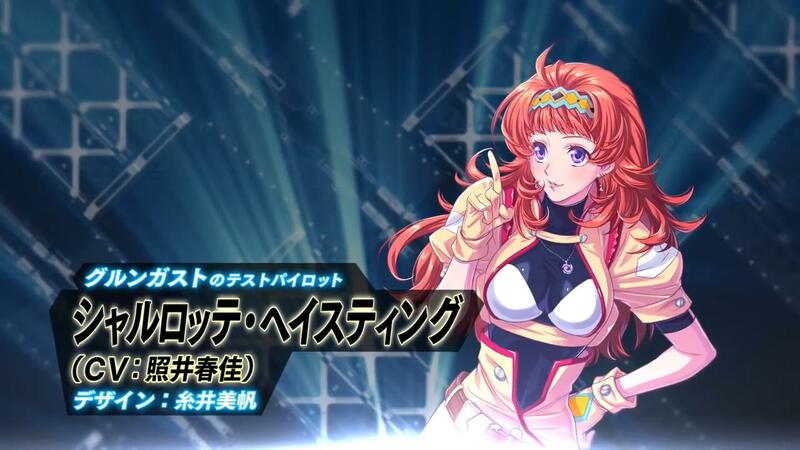 Grungust pilot/Charlotte/Lottie is voiced by Terui Haruka. I’m looking forward to her KEITOU RADOU KEN! ANKENSATSU! ZAN!! The two of them don’t have lotsof previous roles, I’m happy SRW always gives some new OG roles to less popular seiyuus. YOU CAN CHOOSE PROTAGS BETWEEN CHITOSE AND SOUJI. One of the things about SRW OG chars these days I’m sick of is the theme of two seaters of a guy and a girl so I’m happy it’s not like that in V. Gonna sound like tumblr but I’m getting really tired of “heroines” who’re just there for the MC. While Suzune and others recent OGs chars were great characters, I’m really sick of two seaters OG one girl one boy OGs. Plus they pretty much did every relation possible by now. Teacher student duo. Brohter sister. etc. So I’m happy this isn’t the case with V.
It’s not choose between 4 or more characters + their personalities like in 4 or Alpha 1 but the fact that you can choose protags again+ Huckebeins and Grungusts really makes it feel closer to older games and more anniversary like. The other protagonist you didn’t choose will appear as well. I like Souji he looks cool and almost black skinned gonna sound like tumblr but that makes me happy. Bamco asked Terada and the others producers what they could do to make the game feel more anniversary like, and putting in Huckebeins and Grungusts was one of the suggestions, as they’re the first ever OG mecha with Gespensts and Cybuster and Granzon and Valsione. Forgot who came first right now. The Grungusts and Huckebeins in V have absolutely no connection to the ones in OG games, they will even be made by new scientists and a new laboratory which isn’t Tesla labs. In the PV is says they’re made by Nikola Vilhelm laboratories. There’s a preoerder code that gets you the Grungust and Huckebein earlier in the game. However they’re in the game anyway, you’ll just get them normally later. You get bonus BGMs if you preorder too. Terada said to look forward to the story of how Kouji will get in Shin Mazinger Zero, as people who read the manga know this can’t end well. And it’s the Kouji from Z hen/anime that’s in, not from the manga. He also said something about why Tetsuya pilots the Majin Emperor G and something about him screaming his lines a lot but didn’t catch it. Crossbone appears pretty early in the game but the 1st mech is the OG. This entry was posted in Opinions on..., Super Robot Wars on October 31, 2016 by rockmanshii. On July 13, the official Suparobo twitter started something funny. I wrote “Hate isn’t a good thing so I forgive you for myself and the future”. In the end it ended with 78% I forgive you so the wallpaper got published on the official site a few days later, on august 2. The wallpaper is available until August 31. I still haven’t bought Super Robot Wars The Moon Dwellers. Barely spoiled myself anything either. I want to get the ps3 version. Can’t get the english asian region version since I don’t have a ps4. It’s a bit irritating because used copies of the jp ps4 version are already very cheap on Amazon, around 4000 yen while ps3 version still is around 5600 yen. I also need to find a way to buy on Amazon anyway so I’m not in a hurry. Maybe I’ll just wait until Persona 5 is released and buy it instead, and wait even more for the price to drop for OGMD. 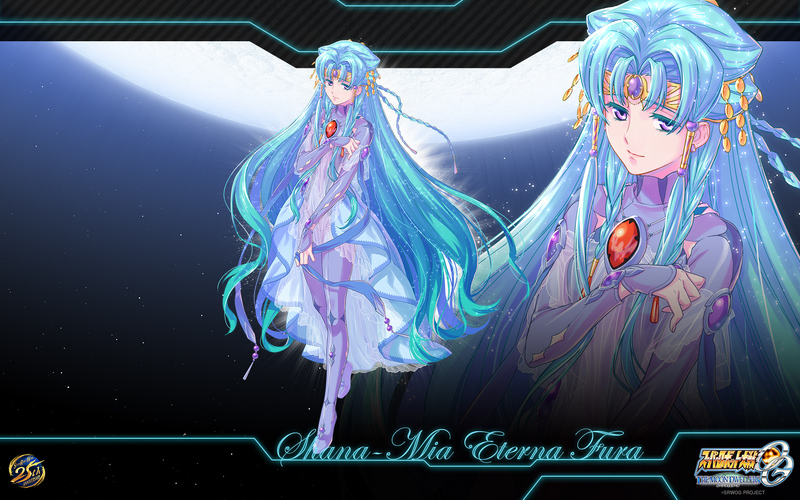 This entry was posted in Opinions on..., Super Robot Wars and tagged SRW, SRWOGMG, Super Robot Wars The Moon Dwellers on August 5, 2016 by rockmanshii. Some videos leaked and screens too Looks even cooler than the best animations in Z3. 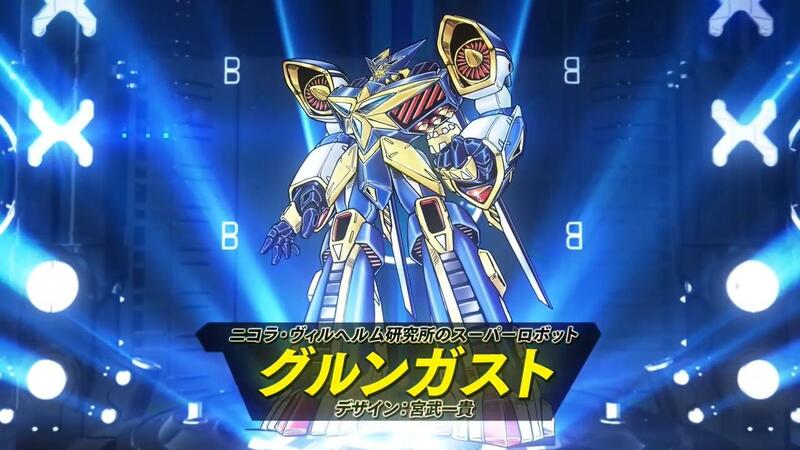 They implied in interviews dark brain is coming back so i figured pachinko kaiser would get new animations but this is way more awesome than what i expected. all dat obari. This is pretty much anime. Gravion oniichan would be proud. I don’t want to spoil myself too much so I stopped following the 2ch thread after Coustwell appeared. I did my J run with him so pretty happy he’s in, even if only as an enemy from what I saw for now. This entry was posted in Opinions on..., Super Robot Wars on June 28, 2016 by rockmanshii.